I see all those beautiful models under sail and that is really impressive. Now, I'm thinking about to equip my model (1/48) also with sails, but all of them furled. As the sailcloth I plan to use very fine Egyptian cotton. I know it's too thick scalewise, but when they are furled it's looking much better. Another possibility is mousseline or even migaline. What do you all think of the idea ? By cutting the sail in half you will be able to furl it to scale and it will look better and neater. 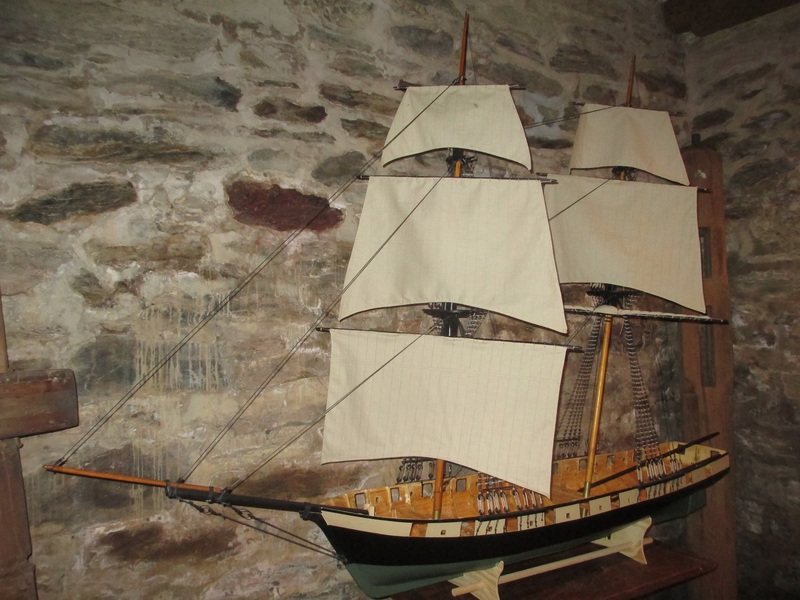 You might have a look here: http://modelshipworldforum.com/ship-model-rigging-and-sails.php The article by John Tilley. Some of the links are dead as it's an old article but still a very good one. 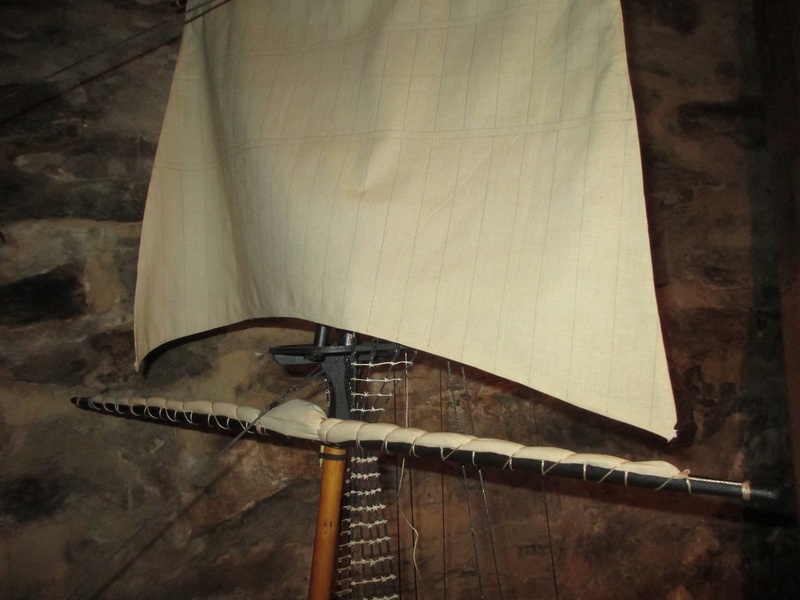 The problem with being literal and folding an actual scale sail which is made of fabric and the correct size and shape, is that due to the nature of the woven material it can never be folded as tightly or make as small a bundle as an actual sail on a real ship. The fabric can not be compacted down to the scale size and the wrinkles you get will also be hugely out of scale. I suggest tissue paper moistened with white glue and water and then formed into the correct size bundles then painted or lightly stained to look like sailcloth. When dry this stuff is very convincing as it has the organic look of an actual fabric bundle and it even has tiny little wrinkles. Do you have any "convincing" pictures of those "tissue" sails ? If possible dyed and undyed ? I posted some pictures of a completed Heller Vic complete with furled sails using tissue paper doped with acrylic paint/pva glue. You can view them under New content/ Gallery/Heller Vic. Using this technique I found I could furl an almost full size sail and still get it to furl up how I wanted. When you write "tissue paper" I assume you mean the paper you buy to use to wrap around an article of clothing, like a scarf or blouse, before you put it in a box to wrap and give as a gift. Not the stuff you blow your nose in... Right!? Kleenex is an option because it can be split into layers and has better water retention properties than some tissues. However Silkspan is the best option, it can be obtained in different weights, and works well when painted with diluted pva. It makes realistic sails particularly at smaller scales. Years ago I used the thin silkspan to create furled sails on my Oneida model following the furled sails article by Professor Tilley. I 'painted' the basic silkspan, stretched over a picture frame support, with a combination of diluted PVA glue, water, and acrylic paint, let it dry, and then cut the stiff sail material to size and attached the ropes. When rewetted it became surprisingly rubbery and very easily was folded and 'crumpled' into a furled sail (make sure you have the yard or spar near by lest you furl in into a shape not aligned to the spar). I had some challenges with bolt ropes staying adhered, along with clews and such trying to pull free of the sails, though once the rubbery, furled sails dried - they were quit stiff and solid. I learned later that the combination of acrylic paint and the PVA glue were somewhat incompatible (in terms of sticking to each other) and that would have been the cause of some of my challenges....though the finished sails looked reasonable to me. When did you do the painting ? Before or after the furling ? And how ? Drybrush, diluted acrylic paint, coffee, tea, or ... ? I hope to try to furl a mainsail tonight. I'll take pictures. Done. But, I can't upload the pictures because they are each over 2MB in size. If you're using Windows, edit them in Paint. Just resize the pictures to 1500 pixels maximum in both directions. You can also use GIMP, a free graphics editing program. I'm bending on sails to the yards and then installing RC gear to move them. This is the first time I ever furled a scale square sail. I believe this will help with the model's sailing balance. Thanks guys for all the comments and examples. Does anyone know and/or has examples of how the staysails are furled. For example the main staysail or the different jibs. I've read that furled sail are stowed on top of the spars and not in front like in different contemporary paintings. Can somebody help me out with that ? Depends on what era. Early (1600's) sails were furled in front of (or under) the yards. Topsails were furled to the topmast. Later when jackstays came into use sails were furled on top of the yard. Perhaps others may know more about this. Does someone has pictures and/or explanations on how to furl the different types of sails ? How and whereto did those seaman the furling of those different sails ? How was the endresult of a furled staysail, main course, fore topmast sail, the different jibs, etc. There are some photos of furled sails on my build log of my HMS Victory model -still ALMOST done with this model- and a lot of written verbiage about my opinions about the subject. I think a lot of ship modelers overlook the complexity of the subject and the results on their models often fall short of the quality of the REST of their models. Its hard to get comprehensive understanding of all the subtleties of what is going on with sail handling but you can not go far wrong by looking at photos of actual sailing vessels. Even though, as mentioned above, methods have changed on how sails are handled over the centuries, you cant beat an actual photo or video of an actual sail being used in real world practice. Fortunately we live in a time where there has never been so many photos and videos of real sailing ship stuff being recorded by actual sailors on their smart phones. Now we can go online and see almost every evolution of sail handling if we just search long enough. Few of todays tall ships dont have a facebook page FULL of photos uploaded by actual members of the ships crew who participate in the daily operations of the ships. Most modern tall ships use modern materials but some of them use traditional rig and the first few that come to mind are Le Hermione, Pride of Baltimore II and Brig Niagara. Also check out Picton Castle. I used silkspan for my 'Boston' sails. Very easy to fold and probably the most convincing material available for smaller scales. A book worth reading is "Textbook of seamanship" from 1891. Especially chapter 10 about the sails. Furling, bending, etc. and much more. Jerseycity Frankie, you probably already read it x-times ! Do you have any close-up, macro pictures of the sails of your Boston build ? I'm afraid I don't have any photos Marc. I just drew out the sail plan including stitching patterns etc. to about a third or half the actual length on the tissue using brown colored pencil. The larger the sail the more length I included up to about half the length for the mainsail. The tissue was then stretched across an open cardboard box and washed with a dilute mix of yellow/brown ochre acrylic paint to stain it. Then when it dried, a wash of dilute white wood glue to seal it. 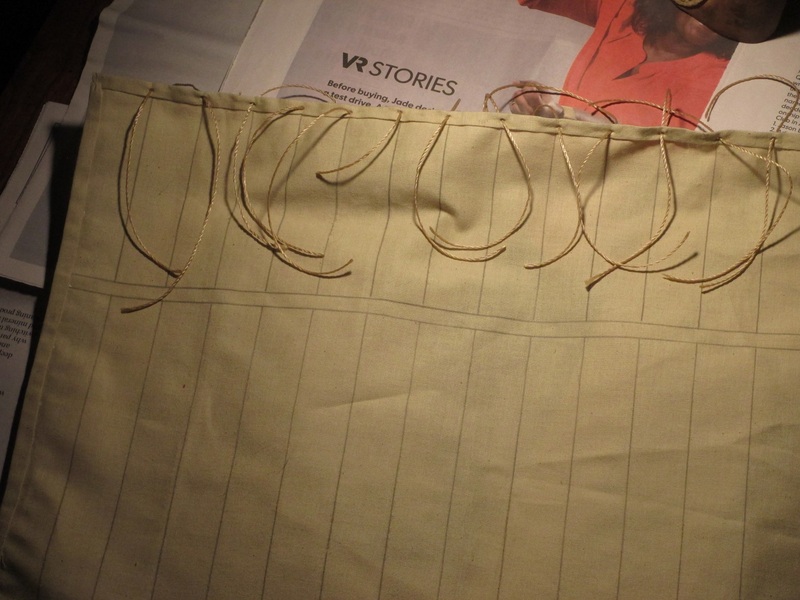 When dry, cut out the sail with a scissors and tie to yard. wet with a spray of water which will make the sail completely soft and furl until you like how it looks. Tie the ropes quite tightly as they dig into the sails and make the 'canvas' look heavy. As the wood glue mix dries it hardens and the sail stays in the shape you tied it. HARLAND, J. (1985): Seamanship in the Age of Sail.- 320 p., London (Conway Maritime Press). I think every sailship-modeller should have this book handy ! There are also various contemporary works that are available as reprints or as e-books for (free) download. For the 19th century this would be e.g. BRADY, W.W. (1852): The Kedge Anchor; or Young Sailor’s Assistant. Appertaining to the Practical Evolutions of Modern Seamanship, Rigging, Knotting, Splicing, Blocks, Purchases, Running-Rigging, and Other Miscellaneus Matters Applicable to Ships of War and Others.- 400 p., New York (Published by the Author). LEVER, D. (1819): The Young Sea Officer’s Sheet Anchor.- 124 p., London (Nachdruck 1963 bei E.W. Sweetman & Co., New York). NARES, G.S. (1862): Seamanship.- 232 p., (reprint 1979 by Gresham Books). There are probably several good sources, but Lees Masting and Rigging is a great source to get into the details down to attaching buntlines, leech lines, bowlines &c. to the sails themselves as well as the rigging from the sails to their belaying points. Another invaluable book is John Harland's Seamanship in the Days of Sail.